Some consider the pyramid bags to be the eighth wonder of the world. 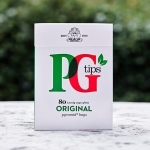 PG Tips Pyramid Bags are a great addition to the PG Tips range. The PG Tips team consider their pyramid bags to be the eighth wonder of the world. PG Tips Pyramid Bags allow the full flavour of the PG tea leaves to circulate more freely, resulting in those great tasting cups of tea. This box of 80 pyramid tea bags should keep you going for a while and - let's face it – everybody loves a nice cup of tea. Pg tips is my absolute favorite. Can't beat the price. Thanks guys! i lived in England 13 years and missed my PG Tips. Great to find them. This is excellent tea - strong, great flavor, quick brewing, and no bitterness. Best tea ever, and I'm so glad you're carrying it in your shop.